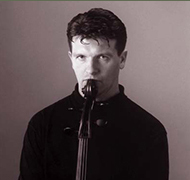 Studied cello under K. Michalik at The Warsaw Academy of Music and graduated in 1989, where he has been a tutor since 1993. He continued his musical studies by taking a year’s post-graduate course with T. Kühne at Hochschule für Musik und Darstellende Kunst in Vienna and attended several master classes in Weimar, Lancut and Warsaw while working with T. Kühne, M. Sadlo, D. Szafran and R. Jablonski. At the age of seventeen he gained prizes at several notable cello competitions including the Young Talent Competition in Dresden and the D. Danczowski National Cello Competition in Poznan, Poland. In 1987 he won First Prize at the Warsaw Academy’s Cello Competition and in 1991 was awarded First Prize at the Fifth N. Zabaleta International Music Competition in San Sebastian, Spain. In his native Poland he appears regularly with many of the country’s philharmonic orchestras including Polish Radio National Orchestra in Katowice, National Philharmonic Orchestra in Warsaw, Concerto Avenna Chamber Orchestra, Polish Chamber Orchestra as well as with such distinguished conductors as Henryk Czyz, Ph. Entremont J. Maksymiuk and Marek Pijarowski. He has worked with many renowned Polish and foreign conductors in performances of Brahms’ Concerto for Violin and Cello which was partnered by the outstanding Polish violinist Krzysztof Jakowicz. Of considerable significance to the artist, was his October 1993 performance of Lutoslawski’s Cello Concerto, which was played in the composer’s presence and directed under the baton of J. Blaszczyk. He also appears regularly on stages in Europe (in 1995 he made his first appearance at the famous Brucknerhaus in Linz, Austria) in Finland, Switzerland, Germany, Czech Republic, Ukraine, Belarus, Austria, Spain) as well as in Kuwait and Japan. In 1999, Strahl was a guest of several important F. Chopin Year’s celebrations and performed together with other Polish renowned artists at the Arts-Center in Tel-Aviv, Israel. He also appeared many times together with Krzysztof Jablonski (pianist) performing the music for a ballet entitled “Fortepianissimo” at the Grand Theatre – National Opera House in Warsaw. He has made number of recordings for Polish Radio and Television. Tomasz Strahl has recorded several compact discs: Complete Chamber Music Works by F. Chopin recorded for “Pony Canyon” in Japan, Cello Concertos by C.Ph.E. Bach for “CD Accord” in Poland (“Fryderyk Award” nomination in 1997), Cello Concerto by W. Lutoslawski for “Polish Radio Katowice” with Silesian Philharmonic conducted by J. Swoboda and several other CDs released by companies such as “Pavane Records”, “Gema Stereo”, “POLmusic” and “Acte Prealable”. In 2000, he toured Japan (Kyoto, Osaka) and performed A. Dworak Cello Concerto with Kyoto City Philharmonic Orchestra and immediately after that he was invited to perform a series of concerts in 2001 in Tokyo, Hiroshima and Osaka. In October 2001 he visited Canada where he performed recitals with pianist Krzysztof Jablonski. The recital in Calgary, Alberta, was recorded live by CBC Radio Two. Early in 2002, he will also perform a recital with Krzysztof Jablonski at the St John’s Smith Square in London. In June 2001 he received a Professor Degree from the Polish President. Tomasz Strahl regularly presents Master Classes in Poland, Netherlands, Finland, Germany and in Japan (Kyoto University of Arts). He is a Professor at the F. Chopin Academy of Music in Warsaw, Poland. In June 2001 he received a Professor title from the Polish President.